A Few Seats Are Still Open for This Program! Get Them While They Last! This program is suitable for children as young as 5 (we'll be using paper, glue, and crayons, but no scissors). All children must be accompanied by a parent or guardian for the duration of the program, which will last approximately one hour. The $5 fee covers the cost of craft materials. 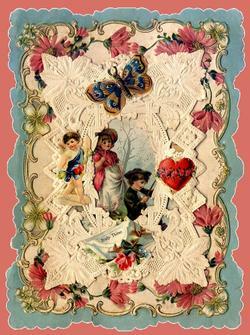 Participants will create Valentines to take home. Seating at the craft table is limited, and preregistration is required. The program fee also includes admission to the Society's 43rd Annual Holiday Exhibition, "Cherished & Charming: Small Houses and Tiny Treasures." Or using a credit card by calling (845) 634-9629.